This arrangement never entirely settles, and that’s what makes it so interesting. The Chasers’ two-beat amble has its own magnetic energy, but their rhythm is a little overly delineated. Phil Napoleon’s trumpet is typically crisp yet slightly tense: his high notes during the introduction sound forced while the turnaround notes in the first chorus are hesitant. There’s a carefulness to the Chasers’ playing, the sound of a band feeling their way through a brand new composition. They’re also figuring out what to “do” with this new song, adding some highly original touches to make it their own. 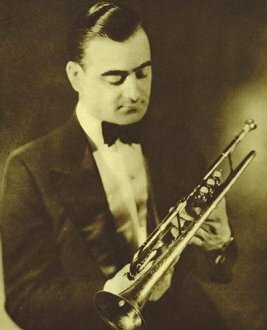 The Chasers feature a standard front line of trumpet, trombone and clarinet, but clarinetist Jimmy Dorsey lays low during the ensembles to let Napoleon and his frequent OM5 partner Miff Mole fashion brass duets. Napoleon and Mole were already seasoned jazz musicians, developing in tandem with the music from its earliest roots in ragtime. The pair displays a refreshingly harder-edged sound and play busier, punchier lines than most of their New Orleans colleagues. Napoleon and Mole even switch roles following the vocal, with muted trumpet decorating the trombone’s burry lead. Eva Taylor’s vocal is charming but Arthur Schutt’s elegant accompaniment behind her is the real find. His classical allusions also turn the minor chords of the bridge into miniature Rachmaninoff preludes. Joe Tarto’s bass keeps snapping throughout while Dorsey’s whinnies add a humorous symmetry to the whole thing. This performance is a departure from the jamming and stride theatrics now typically associated with “Ain’t Misbehavin’.” It’s also far removed from the weight of history and sense of familiarity attached to even the most relaxed renditions of this song. This was only the fourth recording in the history of Waller’s iconic tune. If it shows its age, that age offers a completely unique experience. Thank you, it is very good to be back and to hear from you! ” It is true that beboppers, post-boppers, free-jazzers, fusionites and other modernists never really cozied up to the Fats Waller standard. ” I don’t think that’s true at all. I’m any or many or most of those things and others (but not a fusionite” I suppose), and I am dazzled by all of the versions of this I’ve heard Fats do (solo piano and with a big band). And probably some others. Being passionate about “modern” music doesn’t stop one from loving and respecting previous music, and you’re wrong to assume that it does. Hello Darell. Thanks so much for commenting (and then re-commenting). I would never assume that anyone’s tastes preclude their appreciation of any work. My point isn’t about what any listener may like, but about what musicians frequently play. “Ain’t Misbehavin'” simply doesn’t get the same amount of attention from musicians associated with postwar jazz styles as it does from so-called “trad” players. The list of recordings I reference bears that out, as do most jam sessions and concert programs that I’ve attended by contemporary “mainstream” artists. There’s plenty of other songs that fall into this category: how often do Berklee students at Wally’s call “Some of These Days”? What are the chances Matthew Shipp is going to unleash “Tiger Rag” at a gig? Thanks again for reading and for sharing your thoughts. P.S. I will add that while I know that the JCAO plays great original compositions, personally I’d love to hear one of you do an arrangement of a Jelly Roll Morton tune! Just because music is good, or even inspired, doesn’t make it Serious. It must have no suggestion of entertainment about it. Hey Paul. A lot of music (jazz or otherwise) has been dismissed because it was intended to entertain. Personally the entertainment factor of any musical work always seemed incidental to other factors, such as the arrangement, soloists, performance level and other things my mind and ears noticed. So even if something was intended as a pure throwaway commercial product, if it hooked me musically, I would stop thinking about who or what it was intended for. Entertainment is no mean goal, but regardless of that goal once the sound is out there, its intention is beside the point. If I understand your larger point, there is of course no rule that “greatness” can’t be coextensive with humor or fun (despite what some academics or critics may tell us). Nice to hear from you, Paul.